Galleria Continua will be presenting in its Moulins space a new exhibition of photographs by French-Moroccan photographer and video maker Leila Alaoui. On show will be a number of Alaoui’s serial works, together demonstrating the level of her humanist commitment. 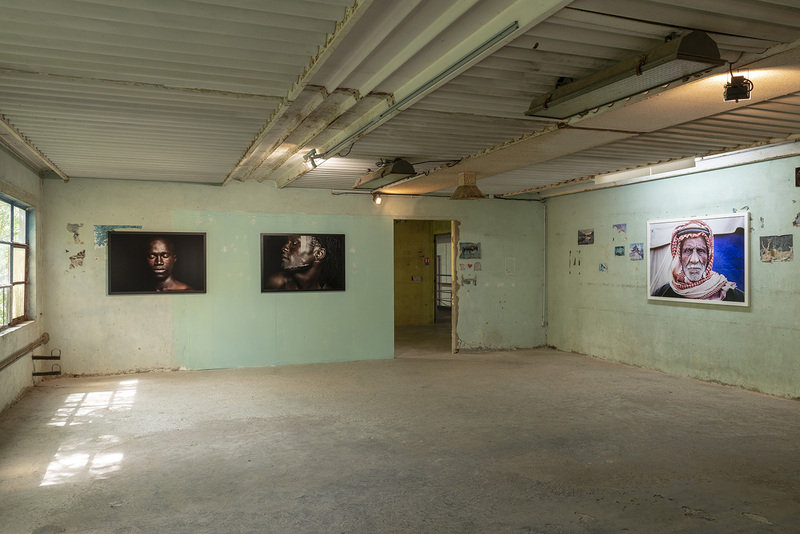 The images that Alaoui has left behind her — for the most part portraits — testify to her deep feeling for the social realities experienced throughout the world by the many outcasts whose faces are continually disappearing behind statistics or stereotypes. As an artist travelling the world, Alaoui defined her mission as social above all else. 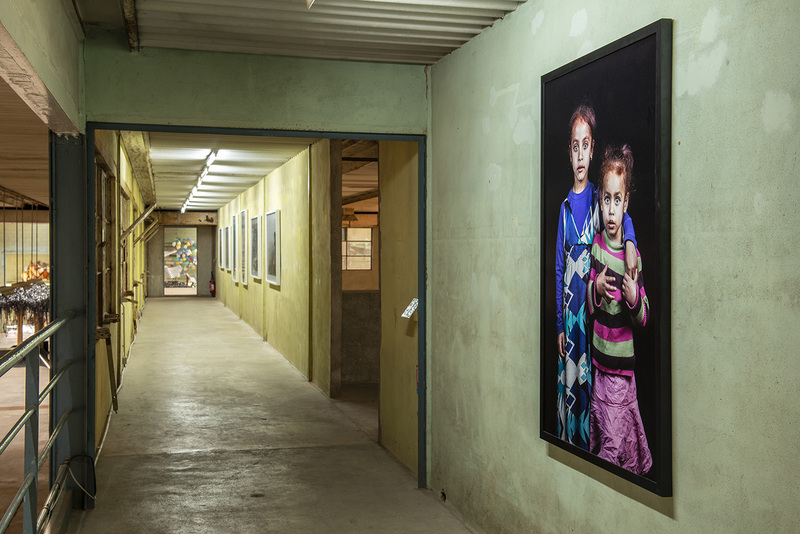 Through their portraits, the people she met testify to a difficult reality, but their faces radiate humanity, giving back to those who have been forgotten the dignity that they deserve. Alaoui’s first photographic project, No Pasara, is presented here in large format. Like a sort of manifesto of her commitment, the series, shot in both colour and black and white, shows the many faces of the Moroccan youth looking for a passage to Europe with all its mirages, candidates for an uncertain exile, uprooted in their own country. Alaoui, as a humble portraitist, knew how to observe them, listen to them, only taking up her camera after long exchanges, long periods together, the better to define their lives, the dreams and mirages of those known as the ‘Harragas’ (the burners), along with the necessity they felt for leaving their country of birth. 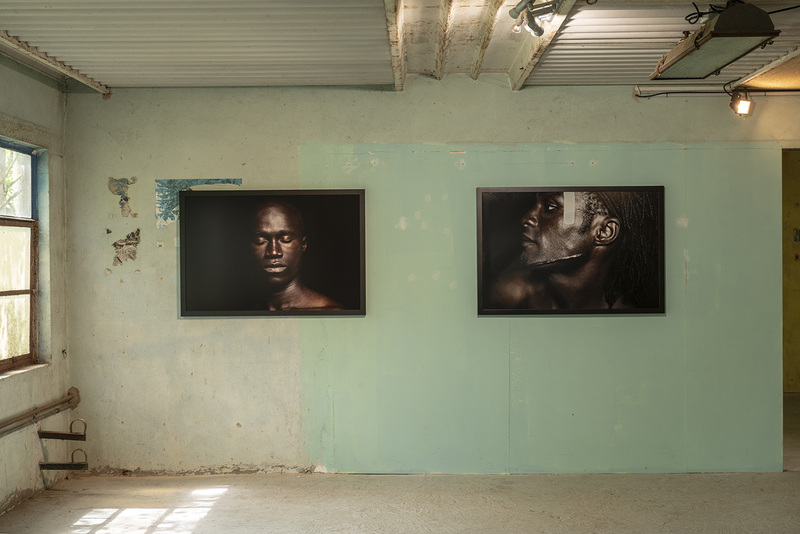 Crossings, with its portraits of Sub-Saharan African migrants, is also an expression of encounters. The series, which began as a video piece before becoming a series of photographs, approaches these women and men who have left everything behind them in search of a better life on the other side of the Mediterranean, encountering pitfalls and dangers on the way, sometimes losing their life there, and tries to let them speak for themselves. Those of them who made it as far as Morocco, their voyage coming to a halt almost at the doors of Europe, carry the visible or invisible scars of this violent, unfinished voyage. The intensity of their gaze, of their voices, of their stories, is of a part with the photographs of No Pasara. People without land or possessions, hoping for a better life but stuck in a situation that seems to offer no escape. Morocco, Central Africa: different places, different reasons to leave. And yet there is the same uprootedness, the same hope—the same reality shattering their illusions. Alaoui determinedly fixed her gaze on this reality, making herself into the echo of these distant voices, all the while capable of retranscribing with finesse and simplicity the beauty of human beings who had thus ceased to be quite the same anonymous figures of the news. The exhibition will also be showing the series, Les Marocains. This long-term project, for which Alaoui drew her inspiration from Robert Frank’s Americans, saw her travelling through Morocco with a mobile photography studio, weaving together as she went a multifarious portrait of a country through those who lived there. Arabs and Berbers, women and men, adults and children, can all be seen together in a mosaic of traditions, cultures, and aesthetics. As a visual archive, the series sketches out the lineaments of the countless customs gradually disappearing under the tide of globalisation. But beyond the documentary work, Les Marocains was also a way for Alaoui to search out her own heritage, to place against the distancing that the camera supposes an intimacy grown from her own Moroccan roots, but also from the relationships she built with the people she met on her journey. It was a definitive way for her to make a claim for an autonomous aesthetic, free of all orientalism, highlighting the dignity of a country and its individuals. In the exhibition it will be possible to see for the first time video recordings showing Alaoui at work, travelling through Morocco, setting up her equipment, meeting the people who live there. These images show us with surprising force the working conditions of the project. The noise and the dust, the almost palpable heat and smells surrounding the figure of Leila Alaoui, who we see such as she was: precise, humble, and kind. 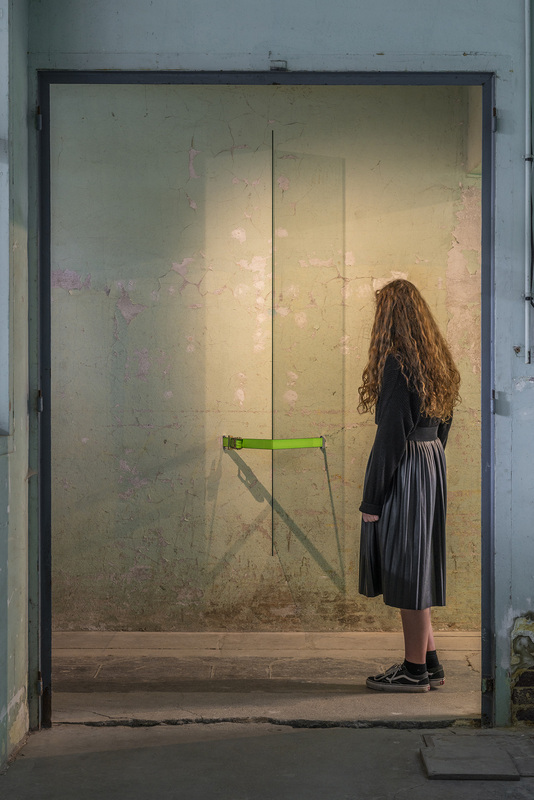 Galleria Continua is proud to present The way we were, a solo exhibition of work by Arcangelo Sassolino, an artist who for more than twenty years has been pushing the boundaries of his chosen mediums, playing with the limits of the possible, with danger, and the emptiness of existence. 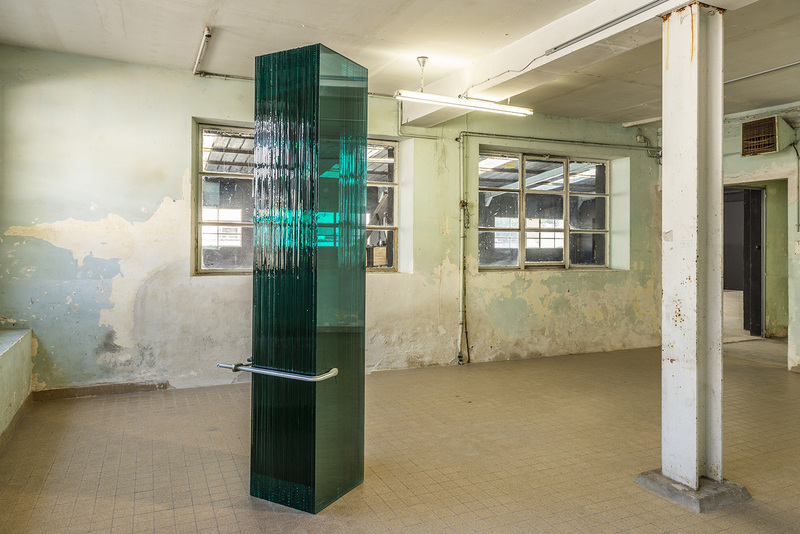 In his mechanised sculptures, materials and forms draw each other in, combine, and struggle to create a precarious balance between poetry and tension, defiantly challenging the laws of physics. Gravity, pressure, or speed take on the principal roles, animating the living dramaturgy of hieratic machines, in love with freedom and speech. The machines populate the exhibition with ‘inorganic performances’, a term used by the artist to define the cyclical, theatrical actions of his creatures. Canto V—a reference to the Dante’s Hell, and the damned souls who inhabit it—dominates the first room. The structure looms in the space, with its wooden beam oppressed by two steel arms connected to a piston. 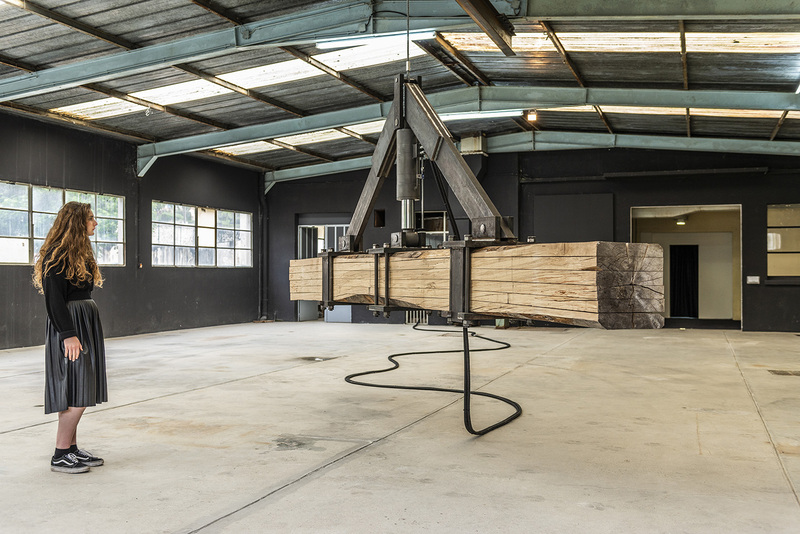 Surprising, mute creaking noises accompany the deformation and the constant bending the wood is submitted to. These at times faint, at times loud lamentations constantly recall the danger of a possible, imminent rupture of the wood, which never happens. Sassolino’s works are the fruit of extended investigations into the possibilities and weaknesses contained in industrial materials. He evaluates, then upsets the vulnerability of glass, the structure of cement, steel’s mass, without ever losing their aesthetic power from view. With Stelle, fragments of glass are uncertainly held together by plastic ties. Their sharp, irregular lines reveal the fragility of the work and transform these wall-fixed orbs into shooting stars. Further on, another kind of tortured soul rises up: The way we were, exhibited here for the first time, and lending its romantic title to the exhibition. The speed and the brutal force characterising the violent action of the press make it possible to crush a black basalt rock in less than two minutes. It is an action in complete opposition with the sweet-sounding name of the piece, with its reference to the Hollywood splendor of the 1970s. The way the piston ineluctable descends, halts, then reascends, whether or not there is a rock under it, creates an infinite cycle, the story of Sisyphus as mechanical myth. The perpetual fragmentation heralds life’s ephemeral nature and the inexorable passing of time, which leaves nothing behind it but a pile of dust. A number of less performative, static works make up the rest of the exhibition. 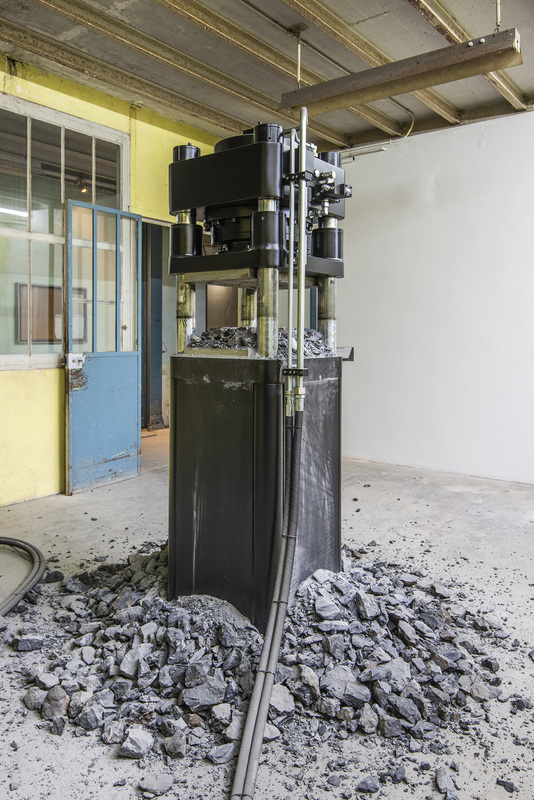 Massimo is a double truck wheel, the tires compressed by a steel vice, which distorts their form. A painful, vain resistance is put into play, in which the tires try to resist this foreign pressure in order to return to their original curved shape. With Untitled, a layer of cement is poured onto a sheet of deformed polycarbonate. The sheet is removed once the cement has dried, and reveals the imprint of every fold, every contour in the sheet. With its workmanship, with thickness, its colour, cement becomes a tamed, protean artistic medium capable of offering up new aesthetic possibilities. 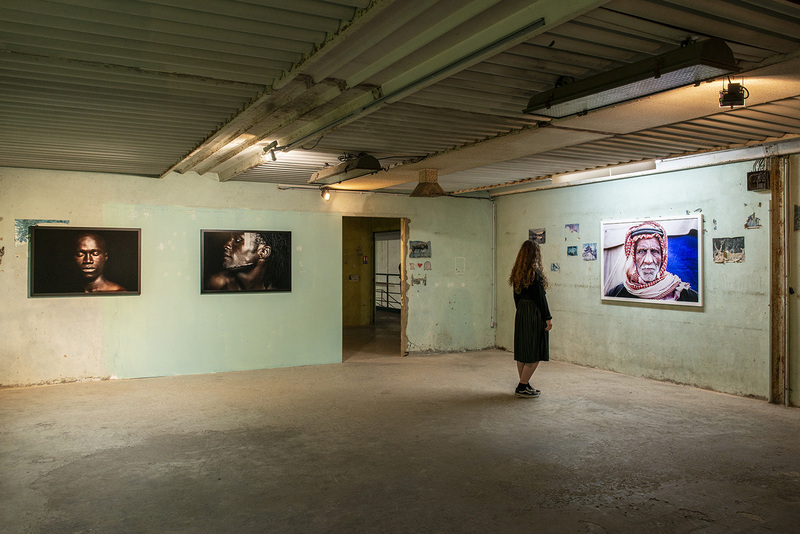 But the coup de grâce, the exhibition’s closure, is to be found in D.P.D.U.F.A. (Dilatazione Pneumatica Di Una Forza Viva). A bottle encased in a steel box, isolated with polycarbonate, is connected by a tube to a cylinder full of nitrogen. The slow diffusion of the gas turns out to be fatal for the glass bottle, which explodes without warning. Repetitive actions, the obsolete rituals are once more condemned to fail, whether as the failure of the action to complete itself, or the destruction of the material. The viewer finds herself immersed in a state of permanent tension, anticipating the moment when something will fall, or the aftermath. Without closing her eyes, she advances prudently through a universe that constantly references the inevitability of passing time. It is with the last explosion, the ferocious conclusion to the life of an inanimate object, that Sassolino holds in reserve the final, theatrical flourish. 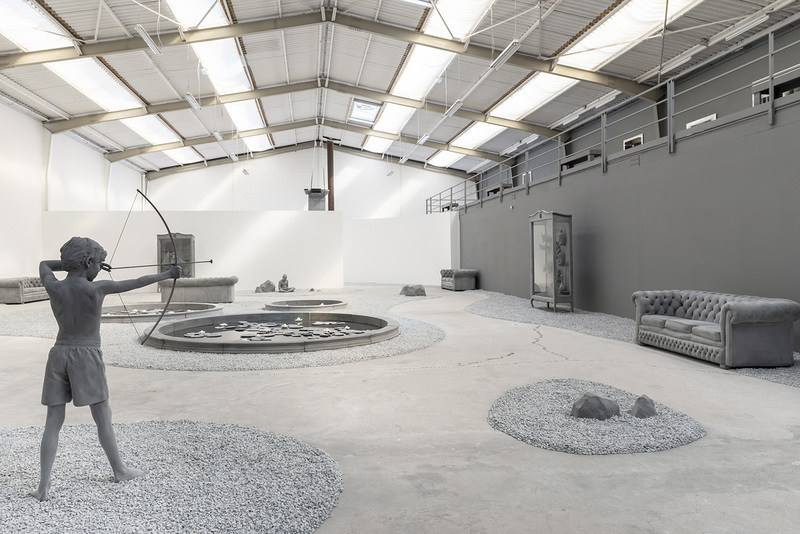 For his solo exhibition at Les Moulins, which also presents his latest film ‘The Girl’, Op de Beeck brings together new sculptural and photographic works into one larger whole, a feast for the senses. On the ground floor, he stages a kind of hiking trail with gravel and small sculpted ponds – as if it were a small, indoor park – in which the spectator discovers life-size sculpted figures of children and a young woman. These silent figures in everyday poses, all of them with their eyes closed, seem lost in thought yet simultaneously caught in a moment of high concentration. There is, for example, a boy meditatively holding a crystal ball in his hands, a boy who just closed his eyes before shooting an arrow with a toy bow, and a young woman listening to music. In addition, there are also a number of monochrome grey display cases in which the most diverse sculptural interpretations of keepsake objects were brought together. The ash-grey artefacts look like fossilized gems or archaeological finds, brought together by a fictitious, anonymous collector. In the tradition of the Wunderkammer of the European Renaissance (Cabinet of Curiosities), the collections of curiosities in each cabinet seem anachronistic and of the most diverse origin. The display cases bridge the thin line between valuable and worthless, between specialness and banality and the importance of stories to bring a still object to life. They are display cases that seem to have been stripped of all their lustre and left behind as silent, abandoned units. 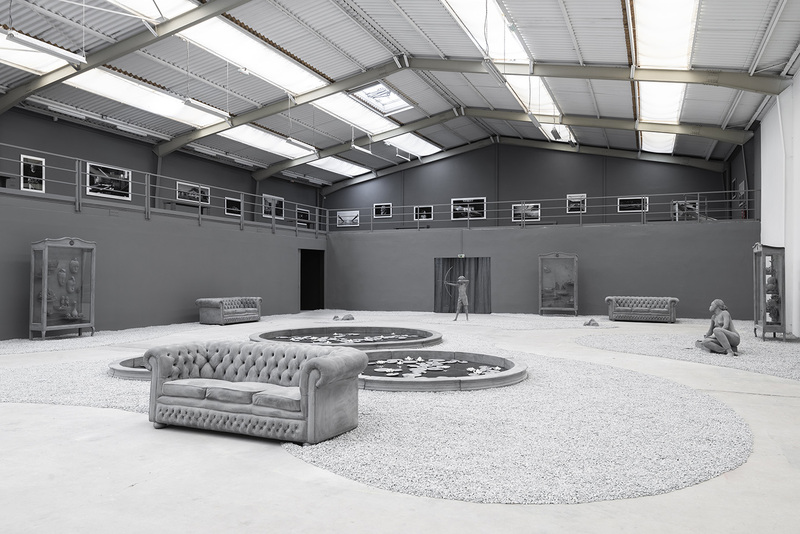 Here, the viewer can take place in sculpted sofas set up in different places, as in a kind of surreal game that plays with the notions of interior and exterior. Also on the ground floor is the entrance to a projection room. Op de Beeck’s most recent film ‘The Girl’ (2017) lets the viewer follow a fourteen-year-old girl as she lives an isolated existence in an old trailer near a lake, a highway and a dark forest. The underlying story gives a lot of cause for thought. Why is she alone, presumably parentless? How does she organize her day, how does she survive? What thoughts are going through her? Why is she floating so resignedly on a lake? 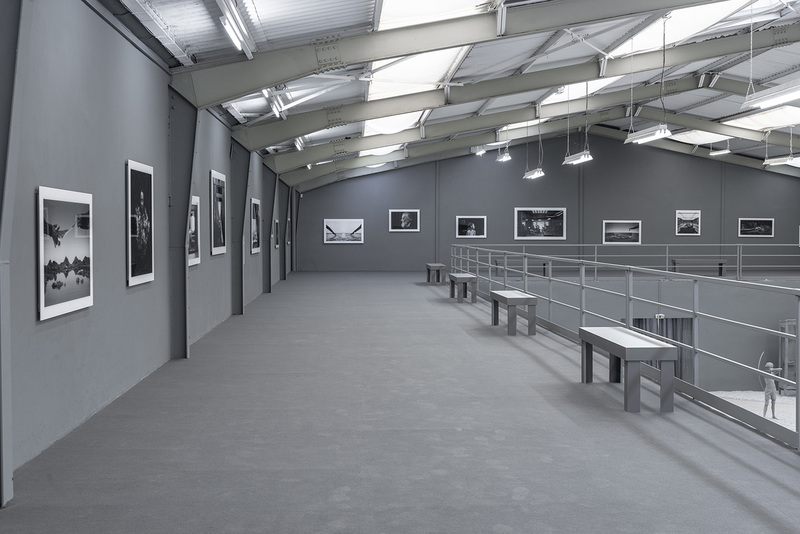 On the first floor, Op de Beeck presents for the first time a large collection of black and white photos in which the idea of the staging of the image is explored in a variety of ways. Fictional natural landscapes as well as interiors and characters appear as life-sized or reduced-scale constructions. For the first time, Op de Beeck also shows a number of work photos that were made in the studio. The photographs address, among other things, man’s tragicomic desire for staging, ranging from furnishing a living room, setting up a party table to shaping the public space. The images blend high and low culture, authenticity and artificiality, taste and bad taste, seriousness and light-footedness. 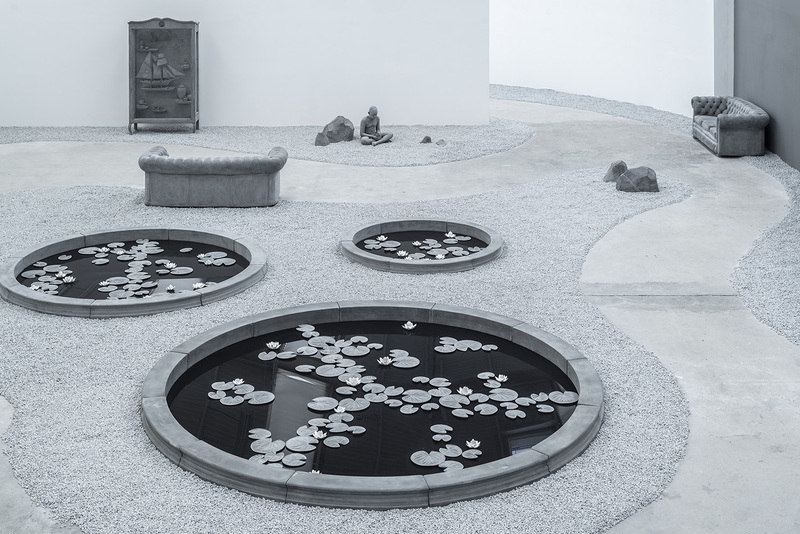 Hans Op de Beeck (B) produces large-scale immersive installations, sculptures, films, drawings, paintings, photographs and texts. He writes, directs and creates stage design for plays, and will start to direct opera this year (2018). His work is a reflection on our complex society and the universal questions of meaning and mortality that resonate within it. He regards man as a being who stages the world around him in a tragicomic way. Above all, Op de Beeck is keen to stimulate the viewers’ senses, and invite them to really experience the image. He seeks to create a form of visual fiction that delivers a moment of wonder, silence and introspection.